Oh my god, where IS she? I’ve been waiting at the entrance to this cave for about five minutes. The orchestral strings slowly swell and recede as I pan my view across the bluffs, paths, and hilltops barely visible in the blinding snowstorm. I’m starting to get anxious. Am I really going to have a reload a save from twenty minutes ago again? Then finally, a blurry figure appears over the hill, sprinting down the slope. As it approaches, crunching footfalls get louder with every step. A familiar face appears under a Forsworn headdress I gifted. Phew. There she is. 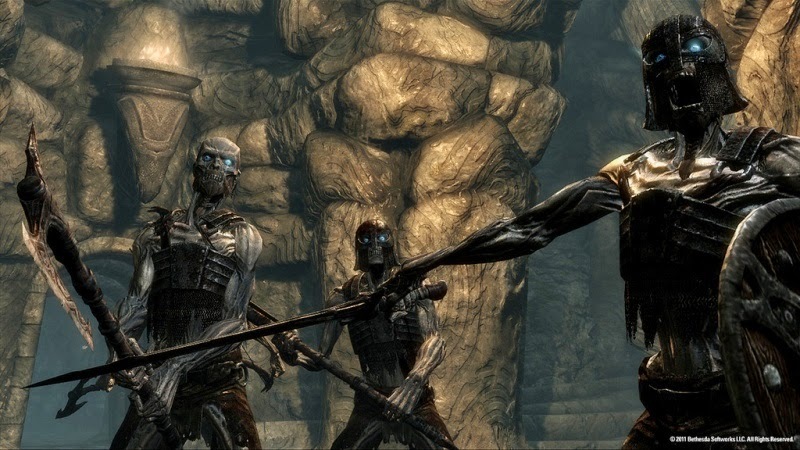 The companion AI in The Elder Scrolls V: Skyrim is notoriously awful. If you decide to sprint through any tough terrain, or sprint at all, you run the risk of losing your partner, momentarily or forever. She may be determinedly running into a bush, unable to decide how to go about moving the twenty feet to where you are, as you imagine your character impatiently tapping his foot, arms crossed. She might decide not to risk a two foot drop and take the long, long way around a main path, and before she reaches you she might get attacked by an ice troll. Traversing Skyrim with a follower means stopping and turning around every few seconds to make sure your partner catches up with you. It feels like what I imagine escorting a toddler through a zoo or shopping mall must be like. And I don’t think I want to be a parent. Companions really slow down your progress in Skyrim. I attribute my having played Skyrim for 128 hours and having only finished the main quest, the Daedric quests, and the College of Winterhold questline, while many other players finish most or all major questlines in that time, to Lydia’s curious and frustrating behavior. So why did I play so much of the game with a companion that made exploring the wintry landscapes of Skyrim actively worse in most cases? I tolerated Lydia blocking narrow passages in dungeons and making me grunt at the TV, “Lydia, MOVE!” because she became part of my adventure, my story, and I soon found that I couldn’t finish the game without her. 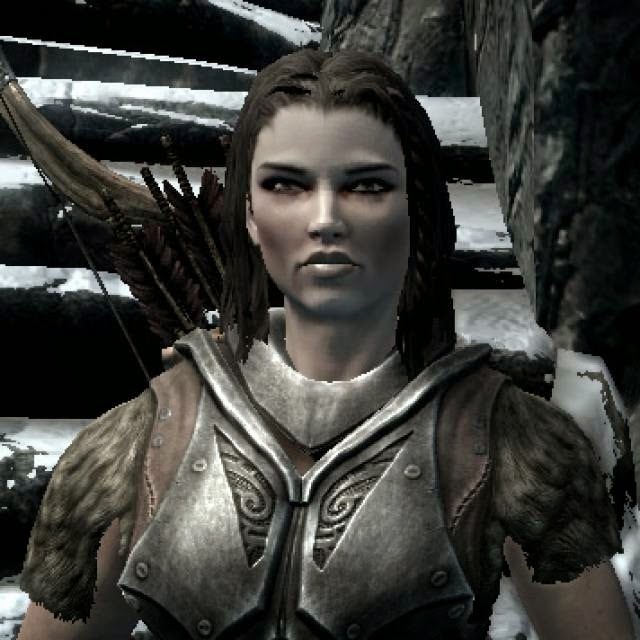 Of the many characters who offered to follow me on my adventure through Skyrim, I chose Lydia to accompany me because she was probably the first person in the game I felt I could trust. She was assigned to be my housecarl after I was titled Thane of Whiterun for defeating my first dragon in the fields outside the town. Though a patriotic Nord (whereas I was an outsider Argonian), she seemed above the shady politics of Skyrim’s civil war, simply ready to serve as my trusty housecarl. She looked tough and capable with her steel armor and had a pleasant voice with an air of genuine righteousness. I figured it would be a depressing existence for a dedicated housecarl to sit in town while I was out adventuring. So I asked her to follow me, and off we went into the harsh wilderness. Lydia proved to be both frustrating and useful, and I quickly grew attached to her quirks. She was a fearless warrior, rushing to my defense against bandits, giants, and Falmer, without regarding the safety of her own life. She almost got herself killed multiple times charging at enemies from high drops (of course she’ll run off cliffs in combat but won’t climb over a hill while exploring). And she often sent her arrows too early, foiling my attempts at sneaking. Lydia always managed to stand her ground, though, and fend off a bear by herself while I was preoccupied by a troll. But certain enemies were too much for Lydia. She was knocked down by giants, mammoths, and some late-game bandits. But her one true fear, her one kryptonite, left Lydia vulnerable and frightened every time we encountered them: stationary boulders. There are traps in many of Skyrim’s dungeons, and most frequently in Draugr tombs, a group of shin-high boulders will roll down a slope after you when you trigger the trap by stepping on a panel. After easily dodging the rocks, they will rest at the bottom of the slope for you to walk over/around them. I did so, expecting Lydia to follow behind. But instead I heard the typical “ow” and “ugh” of Lydia being attacked, so I figured a Draugr must have been following us or got trapped in geometry until now. When I turned around, I saw Lydia repeated run into the short boulders and recoil from damage. You could tell she was getting frustrated. She was yelling, “Damn you!” at the boulders, and I was laughing. But when I approached, her health bar appeared and showed a sliver of health left. She hit her shin on a rock one more time and fell to her knee. I mashed buttons as quick as a could to equip the Grand Healing spell to revive her. LYDIA, DON’T YOU EVER SCARE ME LIKE THAT AGAIN. With Lydia, a small annoyance could become a grave danger, and I guess that’s what made having her around fun. But Lydia was genuinely charming and interesting in her own right. Though she simultaneously endeared and annoyed me with recycled dialogue of “I am sworn to protect you” and “Honor to see you, my Thane,” she was steadfast to her principles. I could typically instruct her to stand somewhere or attack something, but when I pointed at citizens and non-hostiles to assault, she always said something to effect of, “I would never do that!” Yet she remained loyal to me throughout it all, never bothered by the request, or my occasional unsolicited violence against town guards, or later in the game, my cannibalism. She never told the authorities about my behavior, but she probably wanted to... I always wondered what Lydia thought of me; my character was exceptionally creepy. Perhaps she simply learned not to judge those in authority and to instead remain faithful to her duties as housecarl. But it was apparent that she thought something of me. I went through a phase playing Skyrim in which I would collect all the books I found, planning to store them in my home to read some day. Of course, these books were too heavy to keep in my inventory while exploring, so I simply gave them to Lydia to hold. Her exasperated tone when she remarked, “I am sworn to carry your burdens,” every time I dropped books in her pocket meant that she knew I would never read them and was just wasting our time and inventory space. Lydia also seemed to have some secret desires and interests. Even though she was trained to be a warrior, she seemed to enjoy using magic when given the opportunity. Though her primary weapons were the glass battleaxe I gave her and her standard bow, she would often pull out the magic staffs I would have her carry for me. She loved resurrecting wolves and shooting lightning at spiders, and I had to remember to recharge those staffs with soul gems regularly. I imagine that growing up as a Nord, Lydia’s parents shunned the idea of magic, but maybe she was always drawn to it. And I finally gave her the tools to explore a long-forbidden obsession with sorcery and necromancy. The beauty of companion characters like Lydia is that they have just enough personality to be endearing but are also empty husks, allowing the player’s imagination to fill in the rest of the characters’ history and traits. When Skyrim first released, players talked about their experiences of “emergent gameplay,” all of the funny or cool things they saw or did that not everyone does, including epic battles between dragons and giants, goofy glitches of mammoths falling out of the sky, and pedestrian tasks of trying to properly set a table, cook a meal, and serve the food. These moments make every player’s story in Skyrim just a little different. But the random nature of Skyrim’s world alone doesn’t make our stories personal. How we frame events, decisions, and characters in our own created context, whether our imaginations be playful, serious, or cruel, allows us to co-author our (mis)adventures. There was no one to say, “I’ve got a bad feeling about this,” when I approached obviously dangerous areas, like when I entered the Draugr catacombs. As I went through the dungeon, the totally not-scary Draugr sent shivers up my spine every time they aggro’d with that creepy cough as they climbed out of their tombs. These low to high level enemies ganged up on me, freaking me out a little too much with their crazy blue eyes. So I ran the hell out of there before I died and back out the entrance. Looks like I needed Lydia after all. For all of her silly actions and sayings, Lydia is at her best when she echoes the wonderment of discovery in exploring Skyrim. Lydia, we cleared out this Dwemer ruin last week. This blog post was written for Critical Distance’s Blogs of the Round Table June-July Topic on memorable experiences with non-playable characters.